"In recent years, quite a few big IT-suppliers such as Oracle, IBM, Sun Microsystems, Novell, and CA have launched Identity and Access Management (IAM) systems so as to help businesses manage their identification and access authentication processes. Even though the reality is that an increasing number of organizations are preparing to implement IAM tools, attempts to choose and implement the appropriate solutions are sometimes less than successful. 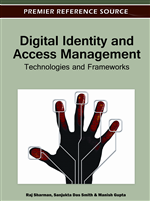 Chapter 18, “Selecting and implementing Identity and Access Management technologies: The IAM Services Assessment Model,” explores how organizations can be helped during the selection and implementation process for IAM services. Owing to the mounting number of applications that are being employed in organizations, stringent policies and evolving relationships between organizations, a novel method for login- and password management, security, and compliance is required. While IAM services generally claim to facilitate this new approach, the authors, Peter Haag and Dr. Marco Spruit of Utrecht University, The Netherlands, show the IAM Services Assessment Model which supplies a helpful and functional tool to assist organizations in the selection and implementation of IAM services."